Parents and children enjoy cotton candy in a carnival. Couples taking selfies in front of staged background in a carnival. Construction Site near Hong Kong West Kowloon Waterfront Promenade, where the Guangzhou–Shenzhen–Hong Kong Express Rail Link (XRL) is currently under construction. 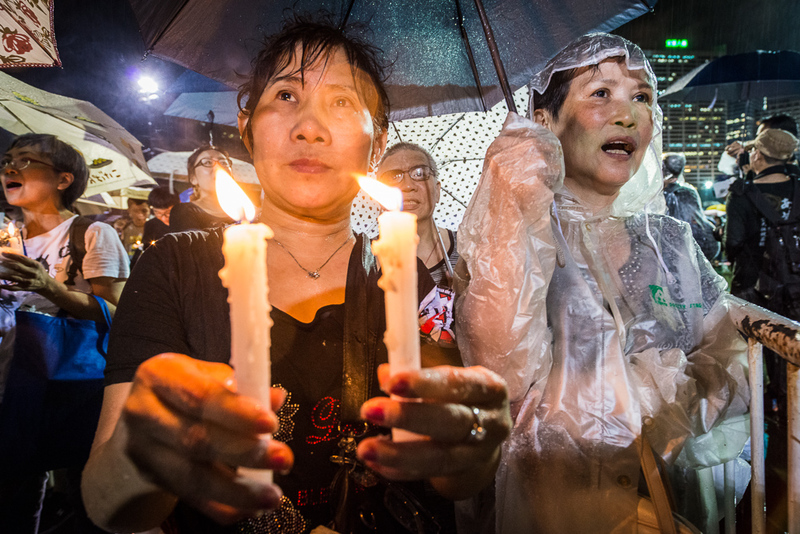 The controversial railroad project expected to connect Hong Kong to mainland China in 2017. Girl taking selfies with her doll friend in train, Hong Kong. Couple taking selfies in a Chinese Lantern Carnival during Mid-Autumn Festival, Hong Kong. Villager bring tourist on a boat trip to watch sunset and fireflies, in Bintain island, Indonesia. Children carring umbellera on a raining night. Man sleeping at a football playground. Woman sitting on a branch near the reconstruction area in Kwun Tong. Man walking pass an electronic store and a barber shop. 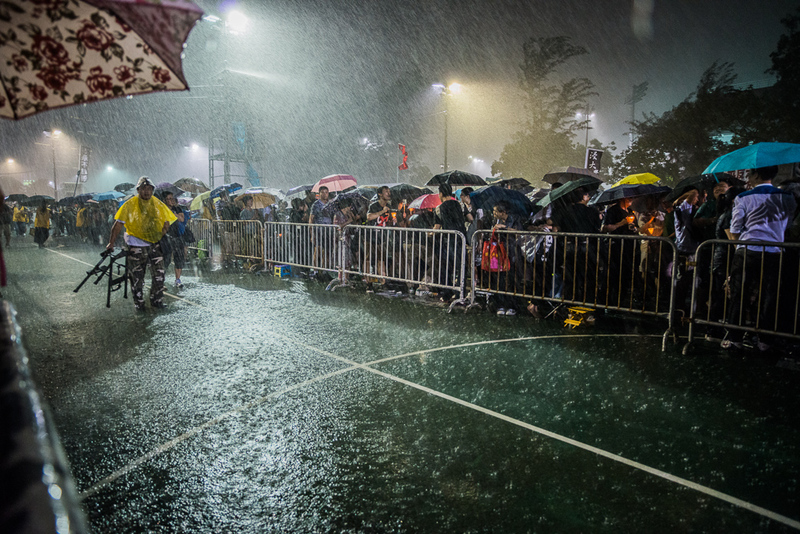 Man walking on a playground in Hong Kong after heavy rain. A nun was falling asleep on train in the evening. Fishing. Sheung Wan, Hong Kong. (30 Mar) Just found the only picture I took with GR on that hailing night . (5 Apr) Spiderman 2 Harbor City, Hong Kong. 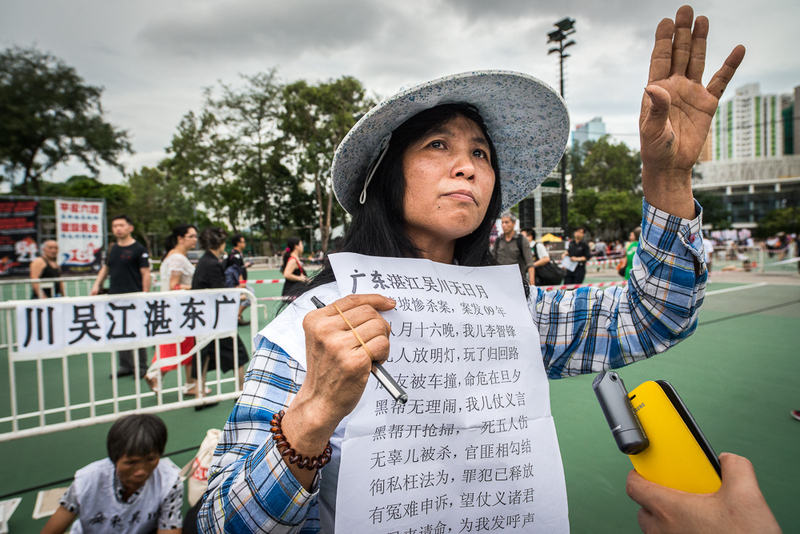 (30 Mar 2014) Anti Chinese Tourist Group Rally, Tai Po. 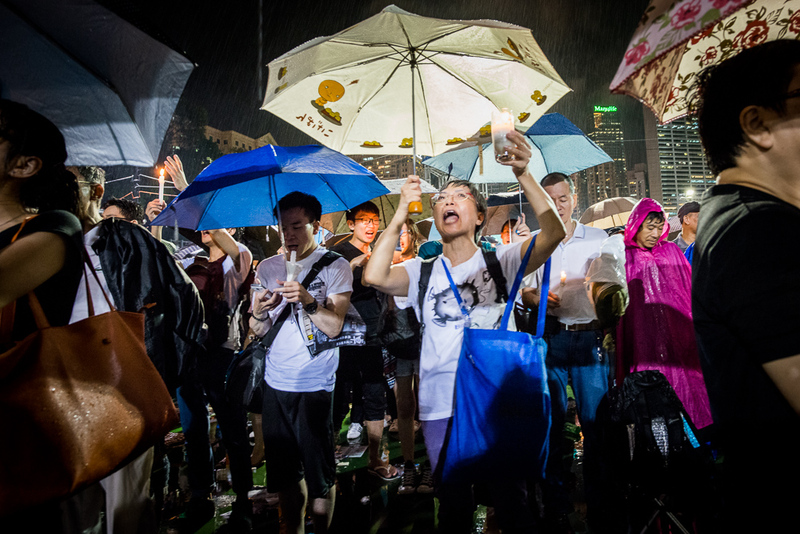 1)Pro and Anti Individual Visit Scheme protesters march from Tsim Sha Tsui Feery pier to Canton Road, one of the most concentrate China mainland tourist area in Hong Kong, to express discontent against to the policy. 2) Political commentators Ms Li Wei－Ling attend City Forum today, to discuss the sudden termination of her employment contract of the CRHK. 18 Jan, 2014. About 100 protesters holding "No Fur" sign in a stop motion demostration outside Times Square, Causeway Bay. LGBT protest in Hong Kong 10 Nov 2013, thousands of participants marched to Central Government Office, demanding passing the law of Sexual Orientation Discrimination Ordinance and sexual equality. 1 Oct was the National Day of China, and 2013 marked its 64th anniversary. 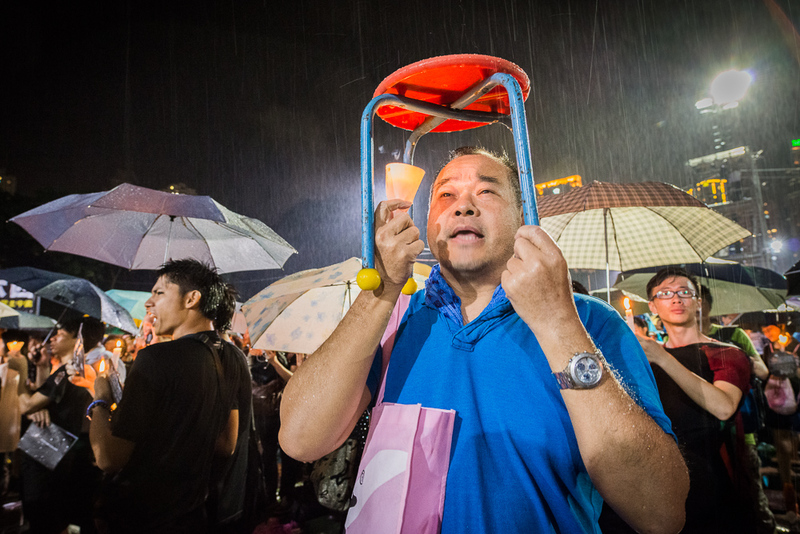 On this day, there are more than half a dozen protests and rally happening in Hong Kong and I covered 3 of them. Team up with Scholarism（學民思潮）Joshua Wong and Oscar Lai（黃之鋒、黎汶洛）at the flag raising ceremony early around 6AM to cover their action. It is an honor working with these young leaders. 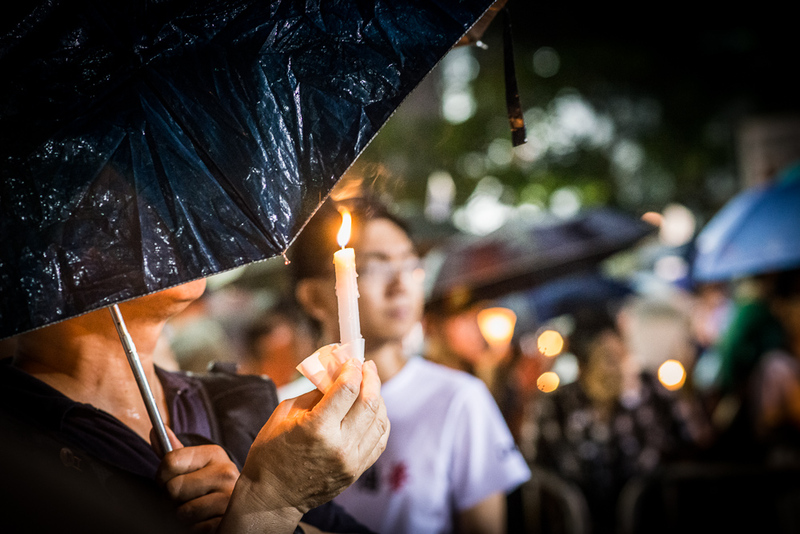 I also covered Hong Kong Alliance in Support of Patriotic Democratic Movements of China (支聯會）protest in Casueway Bay and Hong Kong Federation of Students（學聯）Time Freeze activity in Mong Kok. Othe USP member cover the rest. Click for all photos. Hong Kong Federation of Students（學聯）Time Freeze, Mong Kok. 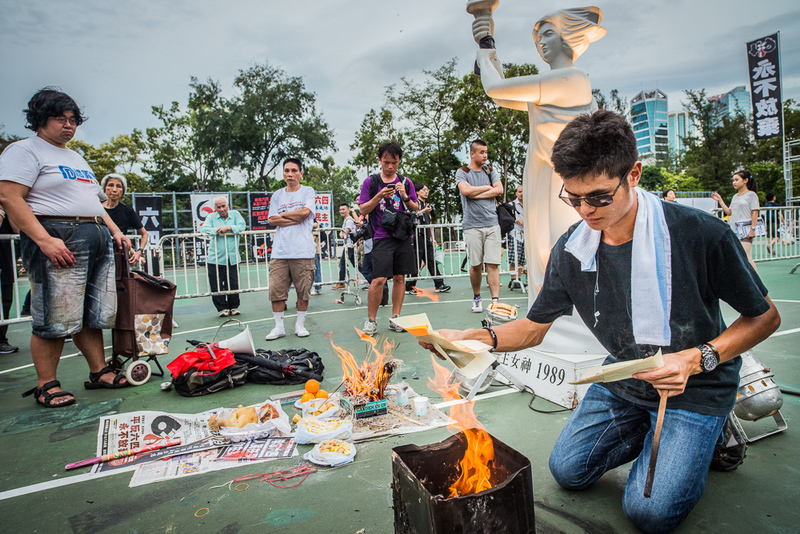 Meet photographer Kaiser Ks today, USP member and the founder of 90sFoto （90後社會紀實）,who invited me to join the action. Kaiser is a very passionate young man with photography. While I got the chance to see how Kaiser take his amazing work. he also shared a lot of thoughts and tips with me about social reportage. It is one of great moment for me since I met Manson. This is the first pic released for my new project :Tsuen Wan Tsuen Wan, a street photography project to cover the city that I live. More photos coming soon! Hong Kong Chief Executive Leung Chun-ying went to the third meet-the-people session yesterday in Wan Chai, Tang Shiu Kin Victoria Government Secondary School. About 400 supporters and opponents rallied outside of the school. Below are the pictures of the event yesterday. This time, I was aiming for a more symbolic way of covering the story. It was a big school and it was separated into 2 part-the front and the back door area. I was able to get most of the shots of the event at the back door, but I did missed out quite a few ones in the front. As a photo journalist, I believed there is a need for me to move around more actively, and be more aware for what is happened at the moment. One "Standing Man" style protest was removed by the police yesterday after hold on to the school's back door gate. I did covered this moment, but comparing to this image, it was definite not the moment. Which left much room for me to improved. Thoughts: next time maybe I will bring a short stairs to these rally to gain sight. More pictures from the day, please see United Social Press FB page. League of Social Democrats Rafrael Wong Ho-ming. Protesters carry wildlife trapper at C.Y. Leung's arrival. One "Standing Man" style protest was removed by the police yesterday after hold on to the school's back door gate. C.Y. Leung leaving the school, driving on the opposite side of the road, away from most of the protester. Met some monks who went shopping today. thought for the days: 1) Should have waited for the monks to finish shopping. 2) Maybe a single pic of monks carry shopping bags out from the store, intead of using 4 pictures to convey the story. 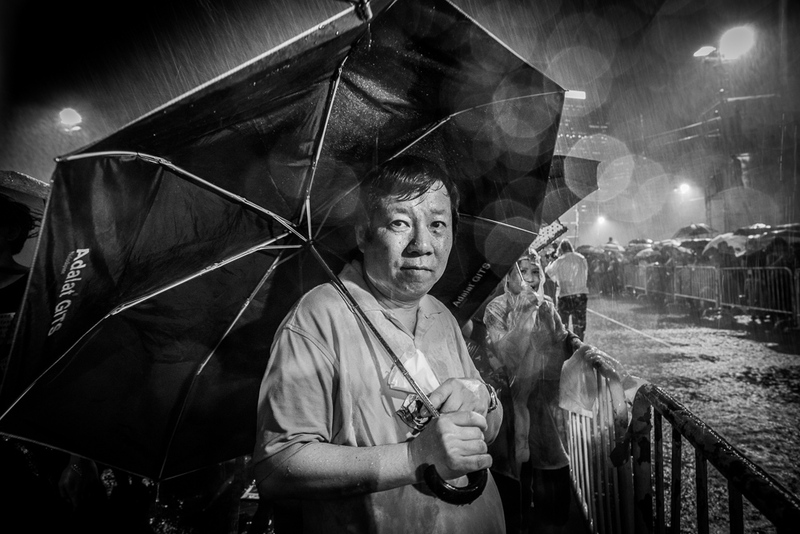 During Yu Lan (or the Ghost）Festival, a traditional Chinese Festival, people would worship their deceased ancestors on the streets of Hong Kong. When covering social reportage, there are major differeces between taking pictures in rallies or and marches. During marches, protesters are often on the street in motion, it gives you space and opportunity to move. On the other hand, much like taking photographs in music concert, taking pictures in a packed rally, the angles of the images to move yourself and your lens are constranted by the limited spaces. Zoom lens may come in handly in some circumstances, in which you have the ability to control how wide or close up as you want to the subject. However, the angle of the images basically remains the same. When you struck in one place, the more pictures you get in the same location, the more boring the pictures would become to the veiwers. That is why I found covering rallies are genuinely more difficult than covering marches. Below images from the recent protest at Egypt Consulate General Hong Kong are example for an rally I didnot handle very well. After all, personally I believed the ability to move to the right place at the right time is much more important than, say, do your lens have the widest zoom range or not. That is the reason I stick with my prime lens almost all the time and practice how to move as a photographer. Although, a-apparently, it is still very challenging to me.